This may come as a shock, but I have had a blog longer than Facebook has been around. I dabbled around with Yahoo Geocities as long ago as 1998. My first consistent blog was born in 2003, a year before Facebook was created. At the time, my “online journal” was where all my updates went. If I took an online quiz, the results went on my blog. If I had photos or funny links to share, you guessed it, on the blog. I posted about my victories and my struggles and added little snapshots of my life throughout the week. That is what a blog should be. As Facebook became more popular and conversations started exploding over there, I went where the people were. Sure, I would still blog the big stuff here. But all that chatter, all that fun stuff was easier to share on Facebook. The comments were better there too, so I stayed. I talked. I connected. And then one day I realized that I had nothing to blog about. Everything I wanted to say, I had already said on Facebook. All the little conversations that would have been great blog posts were squandered by impatience and more likes. Did Facebook REALLY kill my blog? While the title of this post may be a bit on the dramatic side, I do feel my blog has died a little. No, it’s not gone forever but there are so many things I could have said here but didn’t. So many posts I could write rather than just drop a link on Facebook or Twitter and run. I’m not saying I have to write about every single thing I see, but I’ve definitely gotten lazy. Facebook is the drive-thru of social media and I have all too willingly feasted on its convenience at my own expense. So it’s time for some action. I am not quitting social media, but I do want to bring the conversations back to my own turf. I mentioned some blog changes a while back and this is going to be one of them. It might get silly around here. It might get deep. But I will tell you this, it will be me. It will be personal and fun. I may have given up my blog to Facebook for a season, but it’s time to take it back. I do hope you will join me here because I love chatting with you. I will still be posting my links on the Lil-Kid-Things Facebook page and on Twitter so you can find me there. Or if you want to follow me on Bloglovin, it’s my feed reader of choice. I want to be excited about this place and I have a feeling that spending more time here will do just the trick! Thank you again for reading. It’s good to be home. I’ve said that SOOOOOO many times. I used to be the same way, blogged EVERYTHING. Now, it just goes on Facebook and my blog is slowly dying. Right? I am over it! Take it back! Let’s take them all back! Amen! We need to take them back…and get the conversation back! Also, I blame the removal of google reader. Yeah, there’s blog lovin…..but I just don’t find myself checking in there. At all. Also, yes, bacon! I got home from Disneyland and was like, dude, nobody cooked me bacon! 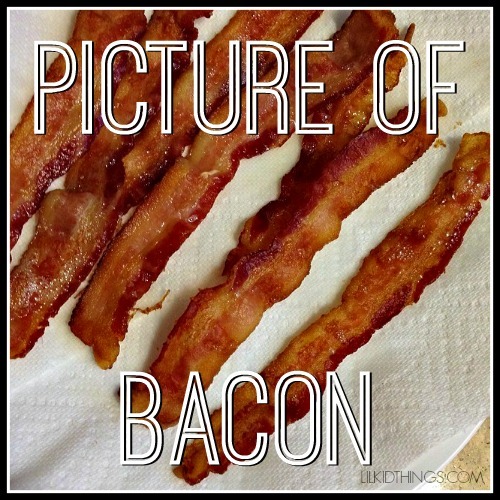 Ahhh bacon, the great uniter. I agree about the reader. I used to be so faithful but not so much these days. Yes! You are so very right. There was a season I posted so much more fun things and pictures on the blog, but FB just was so easy & the feedback is intoxicating. Intoxicating. YES. That is the perfect word.